Unique, vivid, and utterly magnificent! 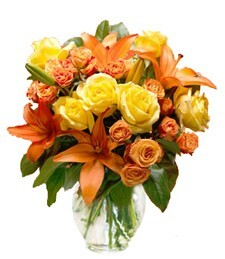 This golden bouquet of orange and yellow roses are offset in a most becoming fashion with lush, attractive greens. So fresh and fragrant--share the glory and send today!